Generally acknowledged to be the greatest - certainly the most challenging - string quartets since Beethoven, the six quartets by Bartok are some of the supreme music of the last century. No serious challenger in the field exists, other than Shostakovich and his magnificent cycle of fifteen quartets. To a considerable degree, string quartet composition dominated Bartok's writing. There were at least three works in the form (now lost) before the first of the six written in 1908-9 and a seventh had the opening bars drafted when the composer died. All six were written in Bartok's time in his native Hungary and Europe before his eventual sad departure for the United States. 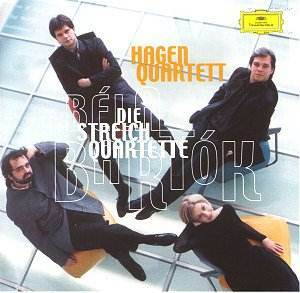 Apparently reluctant to record the full cycle, the Hagen recorded the quartets in two blocks. The first three date from 1995 and there was an interval of almost three years before Numbers 4, 5 and 6 were taped. In their public performances of the quartets before recording, at one stage they withdrew the 5th Quartet from their performing repertoire due to their own dissatisfaction with the results. They concede that much of their insight into the scores has been guided by György Kurtág, an acknowledged expert on Bartok, in playing technique and in compositional analysis. Covering thirty years, as the writing did, inevitably there is change in Bartok's compositional style over the cycle. No 1 came under the influences of Wagner, Richard Strauss and Debussy but even then the eastern European folk element that became increasingly influential in his writing was present and was more obvious in Number 2. The two middle quartets were the composer at his severest and most extreme, while the final two were more traditional despite being true to the composer's own highly personal writing. Increasingly demanding technically with special calls for use of the extreme of the strings (sul ponticello and sul tastiera), use of the back of the bow (col legno), muted strings (con sordino) and the special Bartokian effect that, in a pizzicato passage, insists that the string rebounds against the fingerboard. The cumulative effect of listening to the six in sequence makes one aware of the increasing distress and near- desolation in the slow movements, the sharper and more astringent harmonies and the increasing regional folk music presence - not in direct quotation but absorbed and implied. Dazzling in execution - just listen to the Prestissimo con sordino (No 4 / 2), the all Pizzicato Allegretto (4 / 4), the intricacies of the "Bulgarian" Scherzo ( 5 / 3), and the barbaric attack in the Finale of No 5, or almost anywhere else you care to try. There is near faultless intonation and precise ensemble coupled with involvement and empathy. Deeply felt throughout in the slow passages and especially in the increasingly desolate Mesto introductions in Number 6 with its near-suicidal feeling that closes the work. Yet the players still manage to extract some humour from the musical parodies in the central sections (6 / 2 and 6 / 3). The recording is a match for the Hagen's playing qualities. A strong recommendation for these masterpieces on this new release and a contender for the best version currently available - vying with the Emersons, also on DG, for the honour. Any potential buyer could choose this version without hesitation.